Finding time for your podcast in your busy life can often be a challenge, especially if you have a full-time job or other important to-do lists to get through. This is why time management is absolutely key for carving out that precious time, dedicated solely to your podcast. For most podcasters out there, recording and producing your show is absolutely a passion project so the drive to do it is there, but sometimes the structure is lacking. With these 7 tips, you can easily hack your day to create that perfect sweet spot of time to spend, dedicated only to your podcast. As you create more time for your podcast, you also create more opportunities for you to learn and grow during the process. So let’s not waste any more time, and jump straight into these quick tips! To avoid being overwhelmed by all the things you have to get done in a day, rank each item on your checklist from highest priority to lowest. That way you can be clear on which tasks will be most important to do and you can get them done right away. This particularly applies to the hardest tasks on your to-do list, because the longer you leave them sitting there, the harder it will be to even get started. Once the big things are out of the way, the smaller tasks will simply fly by and before you know it, you’ll be done! 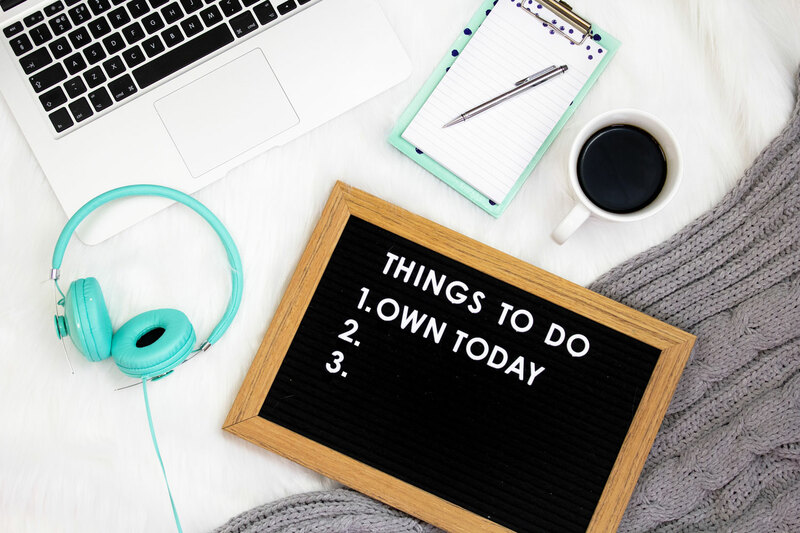 Having all the tasks on your to-do list completed will take away that subconscious stress we often get when you are constantly thinking about everything that you need to get done, that you simply can’t focus on what you’re doing in the first place. This gives you the freedom to record your podcast in peace, with nothing else weighing on your mind. *TIP: Prioritize your podcasting time on your to-do list, and focus only on podcasting during the time you’ve set aside to do it. When you are passionate about something, you should give it the time that it deserves. This includes your podcast! Carving out time to record and put your episodes together should take priority if it is something that you really care about. So treat it like a “job” by letting your family and friends know that you will be busy during the set time, working on your podcast. This will give you a set block of time on the calendar to allow you a few hours of blissful, uninterrupted podcasting! Give yourself this time and space to really get creative. Set up a workspace that helps your creativity flow and inspires you to create amazing content for your listeners. Don’t allow any distractions so that you can really capitalize on the time that you have blocked out for you podcast and really manage the time you have effectively. There’s nothing more detrimental to your precious time than giving in to procrastination. The more you procrastinate, the harder it is to get started, and the less you are likely to get done. If the task seems too big, break it down into smaller, more manageable chunks that will help you to get over the hump of initially getting started. The longer you put things off, the longer the thought of getting started will be weighing on your mind. So start with a checklist, get focused on the first to-do, and simply get started! Once you start it will feel like a big weight has been lifted off your shoulders. This will allow your mind to relax and get your creative juices flowing! So whatever you do, don’t get caught up by that pesky procrastination monster. Your podcast is your “baby” and you should be so proud of what you’ve accomplished, getting those episodes out and giving your listeners the value they’re looking for. With that in mind, if your podcast is your passion project, you definitely don’t have to feel guilty about making the time to do it. Yes, you might have done something else with that time, but you can say that for anything! The key is to know that your podcast is a priority, and it deserves the time you have dedicated to it. Truly let go, and enjoy every moment! It is a lot more productive to use your podcasting time wisely than to waste it feeling guilty for taking the time to do it. With everything you do, there is a sacrifice. But if you don’t sacrifice for what you want, then your want will become the thing that you sacrifice. So set your priorities, designate the time to each, and find the time where you can switch off and clock out to enjoy some down time with loved ones too. A task without a goal is like a dream that is waiting for that “one day” to eventually come. Setting goals can help you keep track of the progress you’ve made, and what you have yet left to do. Each milestone that you lay out will keep you on track and will give you a bigger picture of what you have to work towards. This is true for your podcast as well. When you have no goals in mind, then it doesn’t really matter if you do something or nothing at all! To ensure that you make more time for your podcast, layout some goals or steps (no matter how big or small) and slowly start to do one at a time. When you know what you have to accomplish, you know how much time you need to do it. This way you can be a lot better at managing your time and knowing exactly how much time you need to carve out to reach your podcast goals. So don’t skip out on this crucial step! Podcasting can be quite a solo journey. So if you are struggling to find the time, a great way to be more accountable to your podcast is by joining a podcasting groups. These groups can be a great source of inspiration and can help you meet others who have found strategies for creating more time to podcast. When you are part of a group, it also gives you more encouragement and will allow you to be more excited to talk about your podcast and achieve new levels along the way. It is always better to share your experience and have someone to bounce ideas off of so that you don’t get stuck! So stick your neck out, and find a place where you can get that accountability you need to stay on track and make more time for your podcast. Along with the procrastination piece, another reason why you might not be making more time for your podcast is that you are dreading the whole process. If your podcast recording session takes you 2 whole hours, then often times it can be hard to imagine fitting it into your day. The best way to overcome this is to simplify your podcasting routine. Instead of dragging it out, shorten down your process into smaller time slots for each part of the process. This way you can have shorter segments of time blocked out for your podcast that you can simply spread over the course of a few days. These shorter time blocks allow you to fit it into your busy day and leaves you feeling more accomplished in a shorter amount of time. So, be strategic, make it fun, and enjoy your precious podcasting moments!